Andrei Filote lives better through vertigo. Terry Cavanagh is insane and I mean that in the best possible sense. I say it with gratitude and awe. 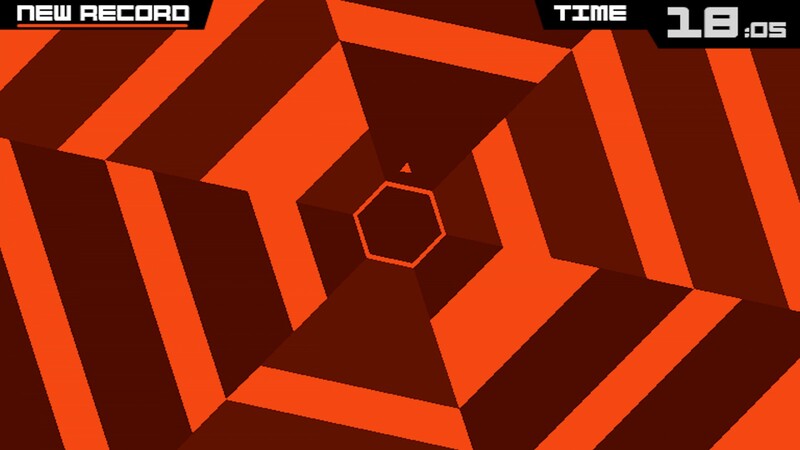 I’ve developed a love for the insanity; the beast that is Super Hexagon carried me through it. I love him because after two hours of the game’s easiest mode I couldn’t quite see straight. I love him because one day I caught myself thinking, “when Super Hexagon gets fast…” and realized that after thirty hours of play, the game had redefined my idea of what fast meant. What was impossibly fast in the first few hours grows glacial in the face of Hyper Hexagonest. Super Hexagon is both a racing game and a dancing game. It’s a crystalline bullet hell with walls for barrages. It teaches choreography and demands nothing but perfection. After perfection is earned, it grows faster and then demands a better perfection. It’s the one game you have no choice but to speedrun. 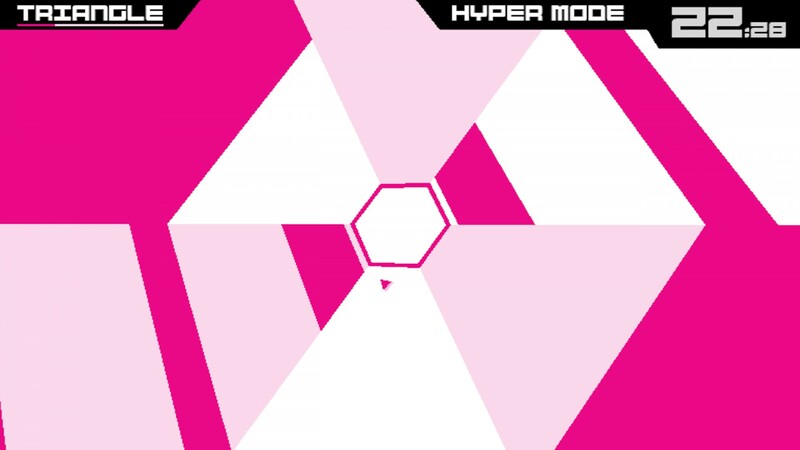 Super Hexagon isn’t about blind acceleration. If it were it would be a lot easier. As it is, it asks you to control your momentum. Precision is an indispensible skill and is tested constantly and more harshly as increasing velocity tasks your ability to judge space correctly. Surviving the madness of and method in each rotation isn’t just key, it’s the whole point. The decision to go left or right isn’t reflex, so much as experience. It’s memory-in-practice, a simple yet complicated game of self knowledge—ignorance of the game’s incoming forms will be the first failures. Crashing is not only inevitable, it’s desirable. Each failure a puzzle piece for the final image of the perfect run. Unfamiliarity with the gauntlet’s motions means unfamiliarity with your own, and only after you know how to move can you begin to control both with any mastery. And the only way is through trial and error. It’s not the spoon that bends, as they say, but yourself. Each stage uses its own little vocabulary: all are composed of many motions, with varying degrees of acceleration, arrangements, and color ranges. Sterile text fails the sheer insanity. When you’ve spent enough time, you get the feeling the motion takes on a meaning beyond itself. You start to want it to be symbolic of something other than your own ineptness. Once again, it’s the speed at work, refusing the staticity of a mere field of color; creating visual play out of the transition between one tone and another. Like a semantic field, but with colors insteads of words, always in transit. You experience not the sight of the thing itself so much as the transition from it to the next. And that’s this game in a nutshell: trying to jump from one moving train to another, the trains suddenly change direction and the location of their doors. It’s pointless to think. Just try to get a handle on t- oh, it’s over. Start again. There’s an irony at work too. You learn grace through blunt force, and find beauty in yourself through a neon-lit meat grinder. But don’t make the mistake of thinking the game is just about overcoming opposition. It’s not about delivering difficulty, as hard as it may be. I had the gnawing suspicion that the game was helping me along, socratically as it were, to understand something new about how games work. How they guide us—not through some easily understood golden path that takes us where we want to go—but through the physically weird. By presenting us with images we aren’t ready to understand, it asks to traverse the incomprehensible. And the beauty of it is that the passage through makes us understand. It puts us through its dizzying inferno of move-countermove until we mimic its machine play. And until then you exult in your own inability to respond to it. You love it either way. And when you finally reach that place of mastery—I want to call it a stepping stone to gaming nirvana—you get it. The game turned you into a mirror of itself, teaching you how to slip between its hyperkinetic tumblers until the parts of you that don’t fit its shapes have been shaved away, and all that’s left of you is a key fitting Super Hexagon’s lock. It just hammered on and on until the pictures stopped making sense but your hand is still punching in keystrokes. Your body, at least, knows what’s going on. Thank it. Or don’t. When you get in the zone, there’s almost a fear you’ll become conscious of what you’re doing. It’s hard to tell what is static and what is in flight. Like standing on the shore of a lake or in a still train next to a moving one, our lizard brains can’t understand where that impression of movement is coming from. That’s the equipment failure Super Hexagon tickles. What Super Hexagon leaves behind is eternally changed, a spirit of frenetic movement locked in a fleshy golem. Though there’s nothing unwelcome in the change. It leaves its victims better understanding how games could be, perhaps even should be, simply by being what it is without compromise or apology. 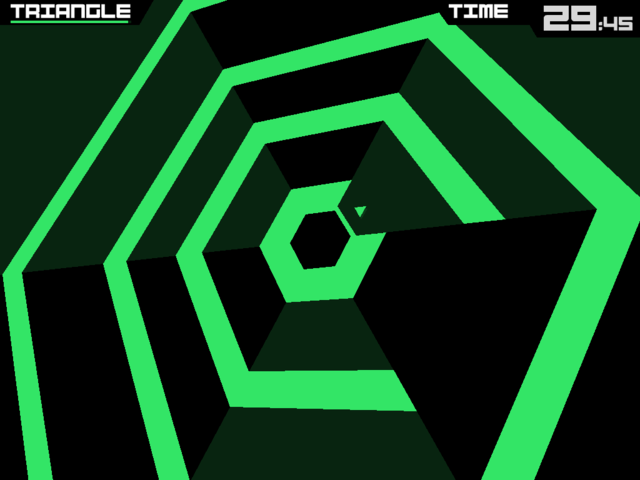 Super Hexagon is an art that must bend its players until they understand how to consume the way it transmits. It’s a form of incomprehensibility set to chiptunes and neon grinders. A form of insanity whose central question is when its player will be crushed, not if. Yet it beckons for one more buy in, ready to break the player over and over, forever. As another, less original game once asked, has anyone ever told you the definition of insanity? Andrei Filote lives somewhere between the Alps and the sea. He studies foreign languages and writes about all things games. You can check out some of his old work at permanentgame.wordpress.com.